NatsU has been indefinitely postponed due to the day/night doubleheader with the Braves caused by a previous rainout. Those who already bought tickets will be automatically refunded. No ETA on a makeup date is available at this time. Bummer! 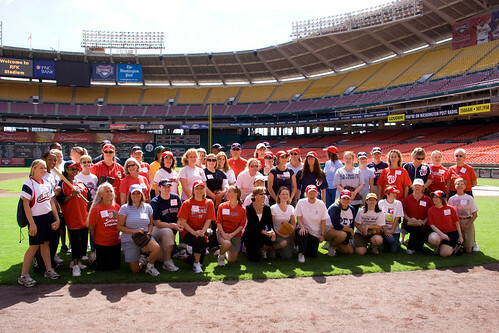 Anyway, Nats U is returning again for the annual day women get to take to the field, bullpen and batting cages for a day of instruction and fun. It starts at 10 AM on July 21st and again begins with breakfast. Included in the two price level cost is a ticket to the game (Scoreboard $50 or PNC Diamond Club $150) that night and the postgame concert by the Wallflowers (yay!). The $50 ticket also includes a $10 concession voucher. Other perks should be forthcoming, such as getting to watch BP from behind the dugout and a happy hour (and now I see the ticket page has been updated with that information as I hit publish…). I guarantee the day is a blast and worth it. This entry was posted on Thursday, May 24th, 2012 at 7:34 am and is filed under Baseball - General, Events, MLB, Washington Nationals. You can follow any responses to this entry through the RSS 2.0 feed. Both comments and pings are currently closed.